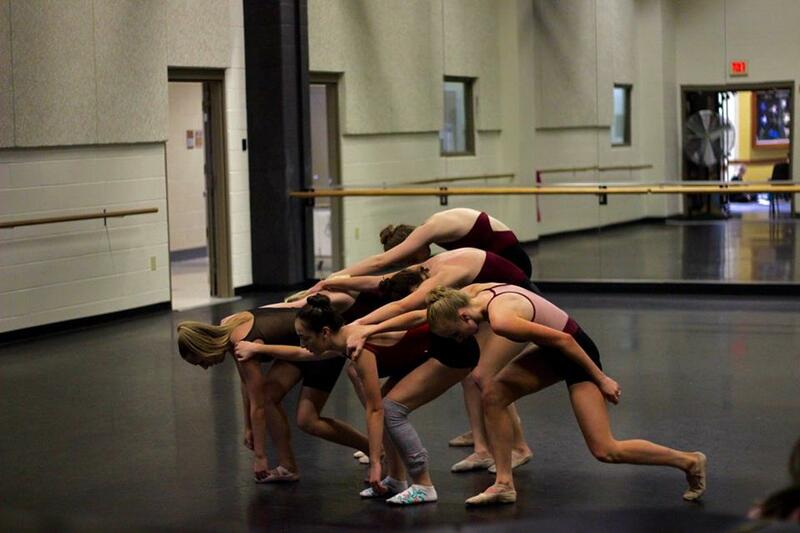 Dance students rehearse a piece of choreography by Kristianna Henthorn. Photo by Michela Semenza. Butler Ballet is putting on their annual Student Choreography Showcase on Oct. 26 and 27 in Lilly Hall Studio 310. This year’s choreographers include first-years Isabelle Ramey, Teryn Trent and Darius Hickman; sophomore Kentaro Shiozawa; juniors Sarah Morris, Leah Wolfe, Kaila Carter, Ciara Cicalese and Ashley Thopiah; and senior Allison Haan. Shiozawa participated in the showcase last fall with an original ballet routine that received high praise from the audience. Sophomore Destiny Billot is one of Shiozawa’s dancers for the second year in a row. Billot is also one of Shiozawa’s closest friends in Butler Ballet. “I love working with Ken, he’s the best and literally so positive about the whole thing,” Billot said. This year, Shiozawa has choreographed a dance that he calls a “neo-classical ballet routine,” featuring seven dancers from JCA. The music features classical themes but played by an electric violin. “The piece doesn’t really have a real story, so I want the audience to experience it and let their feelings flow freely as they bring their own interpretation to the piece,” Shiozawa said. Sophomore Kyra Laubacher is another of Shiozawa’s dancers for the piece. This is her second year participating in the showcase but it is her first piece she has done for Shiozawa. “One thing that I love and find interesting about Ken’s piece is that he has lots of interesting shapes, and it’s really cool that it all magically fits in the music,” Laubacher said. Another of Shiozawa’s dancers, sophomore Fiona Connolly, is also participating for a second year. “He has the vision, and we just have to figure out how to do it for him,” Connolly said. Sarah Morris is a junior and this will be her second year doing the showcase for Butler Ballet. Sophomores Nick Bentz and Francis Mihm will both be featured in Morris’s piece. They participated as dancers for the choreographers in last year’s showcase. The piece Morris has choreographed is in the contemporary style of dance. Contemporary dance is a performance genre that has grown to become one of the dominant genres for formally trained dancers. She has nine dancers featured in her piece. Morris is very excited to be showing her work again for the student showcase. She did not participate her first year at Butler but has continued to build upon her love for choreography. Students can support their fellow Bulldogs for free at 7:30 p.m. on both nights.